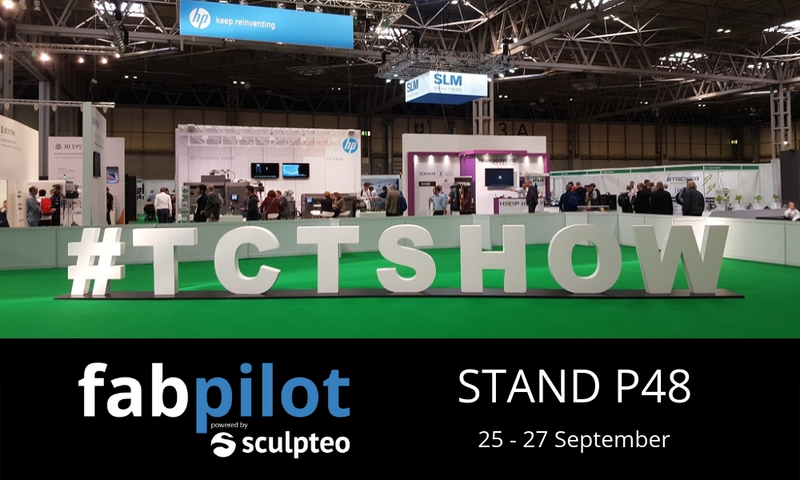 Fabpilot is ready to show you our best from 25-27 September at TCT Show 2018 in Birmingham, UK. TCT Show, is one of the world’s leading design-to-manufacturing events focused on additive manufacturing, 3D printing, design, and engineering technology. For over 20 years, TCT Show has set the industry agenda, bringing together dozens of inspirational speakers, 300+ exhibiting companies and more than 10,000 visitors from over 40 countries. Team Fabpilot is proud to be among this year’s exhibitors and aims to help Additive Manufacturing businesses both small and large to connect with clients, automate production, and power data-driven AM. Fabpilot streamlines the 3D printing process from customer to production, helping you engage with clients and create loyal, repeat customers. We have many exciting things planned for this year’s event! If you’re attending TCT Show this year in Birmingham, UK, be sure to stop by stand P48 to try your hand at our 3D Tetris Challenge, test our FDM integration, and speak to our team about our new Education Program. You can also catch Fabpilot and Sculpteo CEO, Clement Moreau on the TCT Introducing Stage, sharing a decade’s worth of insights in developing an international service bureau. If you’ve ever had to pack a car after a trip to IKEA, you know how challenging it is to make the most of every inch of your trunk space. For powder-based AM technologies such as SLS, HP Jet Fusion, and DMLS, packing a build chamber presents a similar challenge to the Saturday trip to IKEA; how do I get all these parts into a specified volume? Packing the maximum amount of parts into each production run is crucial to optimizing delivery time, reducing operating costs, minimizing wear and tear on machines. The 3D Tetris challenge is your chance to test your packing skills and try to determine how many parts you could print in a single batch of an HP 4200 Jet Fusion Printer. Visit our booth to see how Fabpilot packs parts to optimize z-height and minimize surface exposure and risks of thermal effects causing crashes. If you’re using SLS, Jet Fusion, or DMLS additive manufacturing technologies, the 3D Tetris Challenge is an absolute must try at TCT Show 2018! For the FDM users, we have something just as exciting to announce, direct machine integration is here! Fabpilot users can now connect directly to FDM machines and print from the cloud. With a simple setup and Fabpilot instance, users can upload their files, analyze and repair STLs, slice, and send gcode to the printer ready for printing. This development completes the promised end-to-end workflow, protects files in one platform from upload to print, and streamlines FDM printing for a variety of 3D printing labs. If you’re managing multiple FDM machines, require traceability and file security, or have many users, stop by stand P48 to test out direct machine integration and see how you could benefit from this new feature. As the Back-to-School season is in full swing, Fabpilot is proud to announce our new Education Program to support researchers, educators and program administrators of 3D printing labs in academic institutions and social programs gain access to the latest 3D Printing software and connect students with AM industry professionals. As part of the program, schools will receive 50% off licenses used for non-commercial purposes, full training for educators, support with lesson planning, instance configuration, and access to our network of AM industry professionals. If you’re operating a 3D printing lab in a university, secondary school, elementary school, or community program, be sure to get in touch and see how Team Fabpilot can help! If you own or operate a Service Bureau, you can’t miss Clement Moreau’s presentation: Lessons in Developing an International, Industrial-Scale Service Bureau: Building a Software Solution. With 10 years in Additive Manufacturing, and having built Sculpteo into an international service bureau with locations in Europe and USA, Clement has many insights to share about his journey. Hear how Clement created software solutions to the organizational problems he faced in growing Sculpteo and how you can increase sales, automate production, and become a data-driven factory. You can catch his talk on 26 September at 14:50 in room H50. If you’re planning on attending the show, be sure to stop by and visit us in Stand P48. If you can’t make it, not to worry! We would be happy to give you the guided tour with a live demo. You can also sign up for our newsletter to get the latest insights into growing your Additive Manufacturing business delivered right to your inbox.